I picked a few more things from our garden today. The harvest is winding down but we do have more to pick. I wanted some leaks for dinner (to start off the pumpkin soup) and I had to pick the zucchini before it got enormous. The cucumbers needed to be cut off the vine (they have been getting bitter quickly) and that pepper is going with the roasted potatoes. The melon was iffy. I am hoping it is ripe as I want to serve it with dinner. If not we have a back up watermelon and a few slices from the last melon from our garden (tastes like candy). Yet to go: three or four more melons, a few peppers, maybe a zucchini or two, a couple of cucumbers, cherry tomatoes out the wazoo, lots of leeks. We have several green tomatoes still as well. That isn’t bad for September. And did I mention the basil? More pesto for the freezer (and for immediate consumption) is in the works. Like I said, not bad for September. 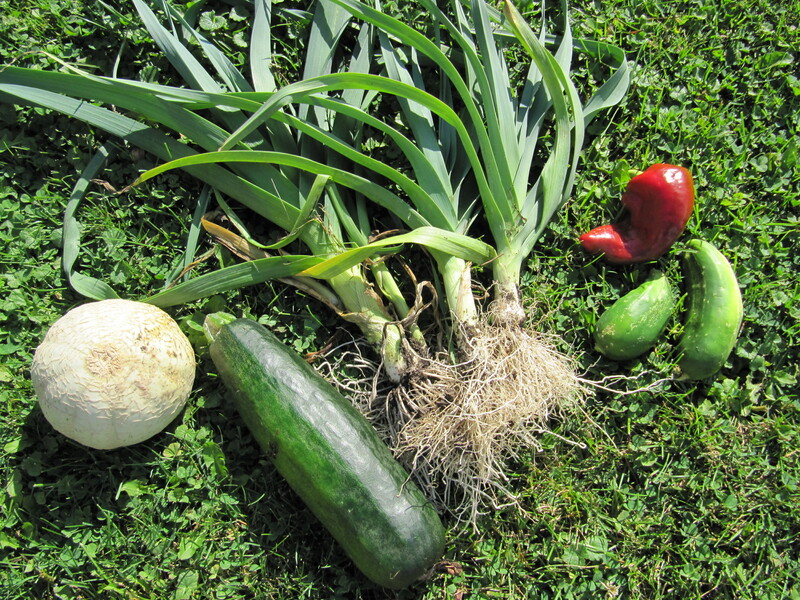 This entry was posted in food, gardening, seasons and tagged cucumbers, dinner, garden, harvest, leeks, melons, peppers, produce, September, vegetables. Bookmark the permalink.